Backed with pink faux linen fabric and matching piping. Made here in Pembrokeshire by a professional seamstress to our designs and specifications. All our vintage fabrics are lovingly laundered before being made up into new items by our sewing team. Something we love to do is source vintage fabrics and have them made into new items for your home. When building a country house look for a home its all about layers and the biographies that these layers reveal. The country house look is not something one can ordinarily achieve in one day . Its an intricate combination of items purchased new, found in antique shops, found in the back of a shed and lovingly restored. Its all of these things lovingly curated to bring layers and depth to a homes interior. Furthermore we try and provide our customers with these items from a variety of sources to help build that layered country look , from one source , with ease. Above all we want to help our customer achieve a look for their homes with a depth and character that seems effortless. 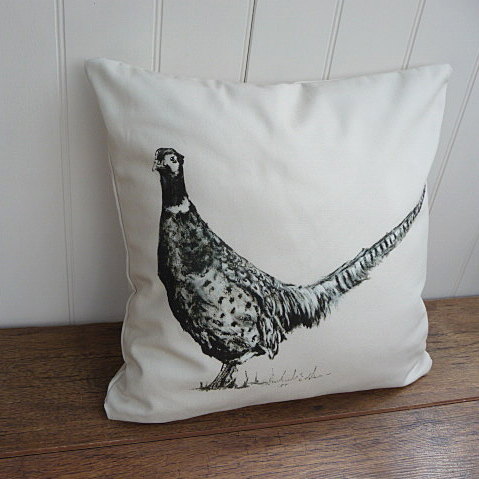 These cushions are a limited edition of 5 only. Each cushion pattern varies slightly.